Crop rotations can be used to optimize economic return by preserving or enhancing soil quality and reducing pest pressure. A field experiment consisting of six rotations of potato with canola (P-C), wheat (P-W), canola-wheat (P-C-W), oat-wheat (P-O-W), wheat-canola-wheat (P-W-C-W), and canola underseeded to alfalfa-alfalfa-alfalfa (P-C(A)-A-A) organized in a Randomized Complete Block Design was established on a clay loam soil in Manitoba, Canada and monitored for fourteen years to assess the relative economic performance of potato in each rotation. A stochastic budget based on returns and risk of returns trade-offs was used to determine each rotation’s profitability. While differences in average annual net income of all crops between rotations were not significant, the P-C-W rotation was the most stable. Despite the economic advantage of P-C in the first two cycles, longer P-C-W or P-C(A)-A-A rotations are recommended, as two-year rotations increase plant disease and decrease economic viability in the long run. Las rotaciones de cultivos pueden usarse para optimizar la recuperación económica mediante la preservación o aumento de la calidad del suelo y en la reducción de presión de plagas. Se estableció un experimento de campo consistente en seis rotaciones de papa con canola (P-C), trigo (P-W), canola-trigo (P-C-W), avena trigo (P-O-W), trigo-canola-trigo (P-W-C-W), y canola mezclada con alfalfa-alfalfa-alfalfa (P-C(A)-A-A) organizado en un diseño de bloques completos al azar, en un suelo arcillo-limoso en Manitoba, Canadá, y monitoreado por 14 años para evaluar el comportamiento relativo económico de papa en cada rotación. Se usó un presupuesto estocástico basado en recuperaciones y en el riesgo de compensaciones de recuperaciones para determinar la redituabilidad de cada rotación. Mientras que las diferencias en el promedio anual de ingresos netos de todos los cultivos entre rotaciones no fueron significativas, la rotación P-C-W fue la más estable. A pesar de la ventaja económica de P-C en los primeros dos ciclos, se recomiendan las rotaciones más largas P-C-W o P-C(A)-A-A, ya que las rotaciones de dos años aumentan enfermedad de la planta y a la larga disminuyen la viabilidad económica. We thank Desiree Czerkawski, Shirley Neudorf, Grant Gillis, Tom Henderson, Clayton Jackson, Rebecca Xie, and summer students at AAFC-Brandon Research and Development Centre for field and technical support on this project. Funding contributions from Agriculture and Agri-Food Canada’s Matching Investment Initiative and in-kind contributions from the Canada-Manitoba Crop Diversification Centre (a partnership among Manitoba potato growers, the potato processing industry and the Governments of Canada and Manitoba) are greatly appreciated. Eviews quantitative software, 2006. http://www.eviews.com/ Accessed 30 Jun 2017. Halloran, J. M., R. P. Larkin, and C.W. Honeycutt. 2008. 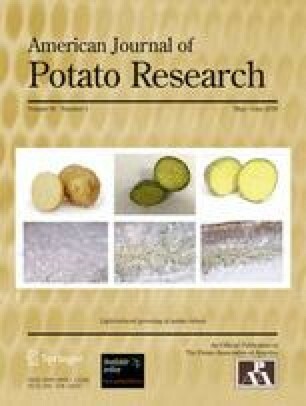 The economic impacts of disease suppressive rotations in Maine potato cropping systems. https://dl.sciencesocieties.org/publications/cm/articles/7/1/2008-0912-01-RS?highlight=&search-result=1. Accessed 15 May 2017. Manitoba Agriculture, Food, and Rural Development. 2016. Guidelines For Estimating Irrigated Processing Potato Costs. https://www.google.ca/url?sa=t&rct=j&q=&esrc=s&source=web&cd=1&ved=0ahUKEwi4lpjfhbTVAhVn6YMKHQ9LCBAQFggoMAA&url=https%3A%2F%2Fwww.gov.mb.ca%2Fagriculture%2Fbusiness-and-economics%2Ffinancial-management%2Fpubs%2Fcop_crop_irrigatedpotato.pdf&usg=AFQjCNHr6PvYDC8O5YepyqFqahGyguJbhQ. Accessed 31 July 2017. Manitoba Agriculture, Food, and Rural Initiatives. 2016. Farm machinery custom and rental rate guide. http://www.gov.mb.ca/agriculture/financial/custom/index.html. Accessed 30 Jun 2017. Saskatchewan Ministry of Agriculture. 2017. Saskatchewan agriculture farm machinery custom and rental guide 2016–17. www.saskatchewan.ca. Accessed 30 Jun 2017. Statistics Canada. 2016. CANSIM in E-STAT database, Table 001–0014: Area, production and farm value of potatoes. http://www5.statcan.gc.ca/cansim/a26?lang=eng&id=10014. Accessed 12 Jul 2017.